Ella has been extremely well-behaved here. I don’t think it’s the weather because she hasn’t even been causing problems inside. I think it is the book. She is spell-bound! Plenty of time left to win — 4 days left to get your posts and comments in. No one on the list is too far behind to win. Remember, you only have to be in the top 5 to win a book! If you need a refresher on the rules, look here. And here I wasn’t going to play. More tweets have been twittered. Nessa — and you’re way out in front! Looks like it´s pretty cold there. Good think you have the stove. Betty — it isn’t cold. It’s pretty much been just right. The stove is too hot! It seems so strange to see a fire in June, but when my in-laws were in ID they often had a fire going in the mornings. That must be a good book if it keeps someone as busy and curious as Ella occupied! Barbara — that’s why I turned on the fireplace — to take the edge off early morning. I had no idea I wouldn’t be able to turn it back off! Now that’s my idea of a vacation! Although I’ll take the bed over that chair. Linda — Amoeba and I had the chair. I’m with Barbara! That must be one heck of a good book! Ella doesn’t usually last past the 3rd or 4th PAGE — much less a few chapters! Melli — it really must be a good book. She won’t put it down! Ella does look comfy be the fire and she must be enjoying the book! Aren’t you proud of her!! Sylvia — I am proud of her! She’s been very good this trip. She looks comfy. I love the litle pink bows in her ears! Soo cute! Teresa — she is cute, isn’t she? 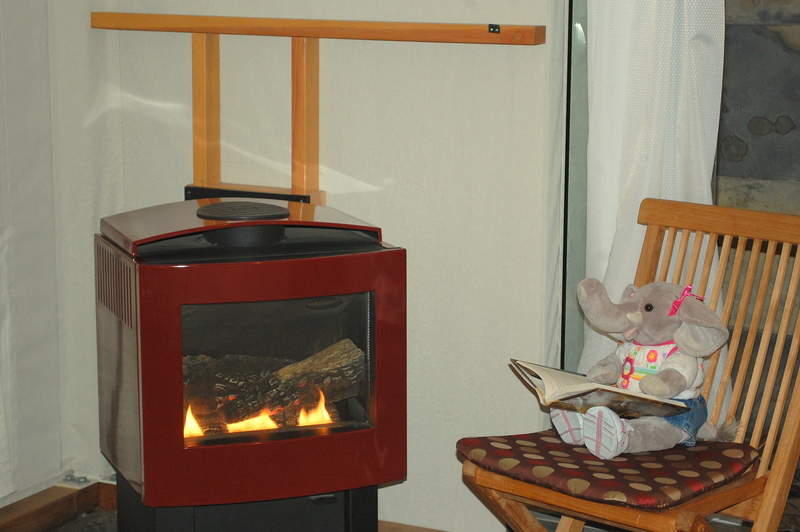 Well, I’d be well behaved, too, if I could hang out and read by a fire! That’s the way to spend an afternoon! Ella’s a smart girl! Well, looks like Ella is really improving her educaion and having a good time. Nice fireplace. I’m repeating myself, but you and Amoeba do visit the nicest places.